This project was started as a Fellow at the Interactive Telecommunications Program in NYC. 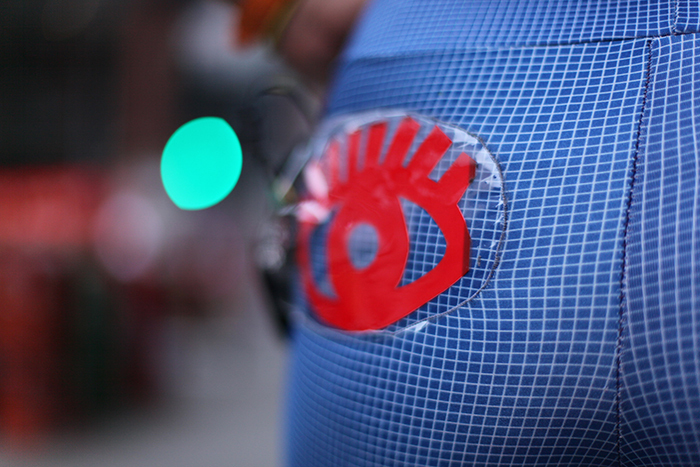 This project in progress is a protoype for clothing that incorporates electronics to increase visibility and safety for the cyclist in an urban landscape. As a long time cyclist, I constantly worry about road safety, especially at night, and I am constantly thinking of solutions to make myself stand out on the road. As a female, I also feel vulnerable in terms of dealing with harassment by motorists late at night. These leggings have EL lights in the shape of eyes that blink in correspondence to the way the cyclist is turning. The eyes reference eyespot mimicry, an adaptation found in different types of animals to scare off predators. In this case however, the eyes serve to make "eye contact" with motorists who are behind the cyclist. By having this playful sense of humor of "winking" or "blinking" at potential predators, the attention drawn from the eyes provide added safety to the cyclist on the road. Whether these garments are actually practical or impractical, I would like these garments to help cyclists and motorists assess and reassess their relationships on the road. Above is a prototype for a soft circuit switch that would be used for a later version of the leggings. This simple switch uses disc magnets to hold the switch in the on/off position. Fabric is sewn around the magnets to hold it in place and conductive copper fabric is used for current. By shifting the middle magnet which has copper fabric attached on the opposite side(shown above in black neoprene), the wearer can easily pivot the switch into the different positions to complete or disconnect the circuit.